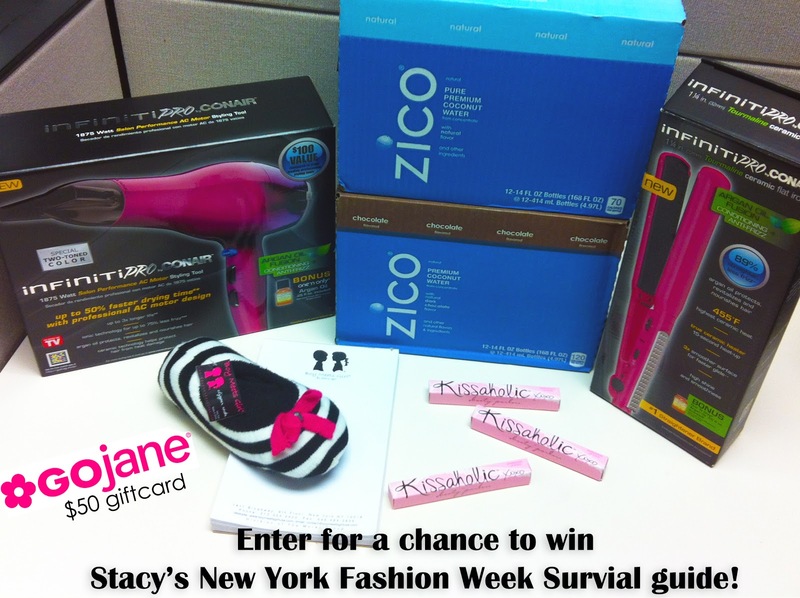 STACY IGEL: Contest & Giveaways: my NYFW survival guide + win tickets to NYFW!! Contest & Giveaways: my NYFW survival guide + win tickets to NYFW!! I can't believe its NYFW again and my own NYFW show is a week away! Ahhh! Not only am I prepping for my own show but I am also attending and/or covering a bunch of shows and parties. Yes that means it is quite madness indeed. Over at my Boy Meets Girl® headquarters we have last minute preparations, long meetings, and late late nights! If it wasn't for a few of my favorite goodies I wouldn't be able to get through this week! So I thought how fun to share with you a chance to win what gets me through the week. I call this my NYFW Survival Guide. 1. Boy Meets Girl® Minky Bean Slippers! I don't have a lot of time to relax around NYFW so my slippers are perfect for long nights in the office doing seating charts and finalizing looks! 2. Zico Coconut water! So yummy and extremely hydrating! A must to keep me moving all week. And you can win 24 bottles of your own too! 3. I am loving my special pair of GoJane shoes and you will see these rock my runway so because they are super comfy we wanted to extend you a $50 gift certificate to their site to get your own pair. 4. 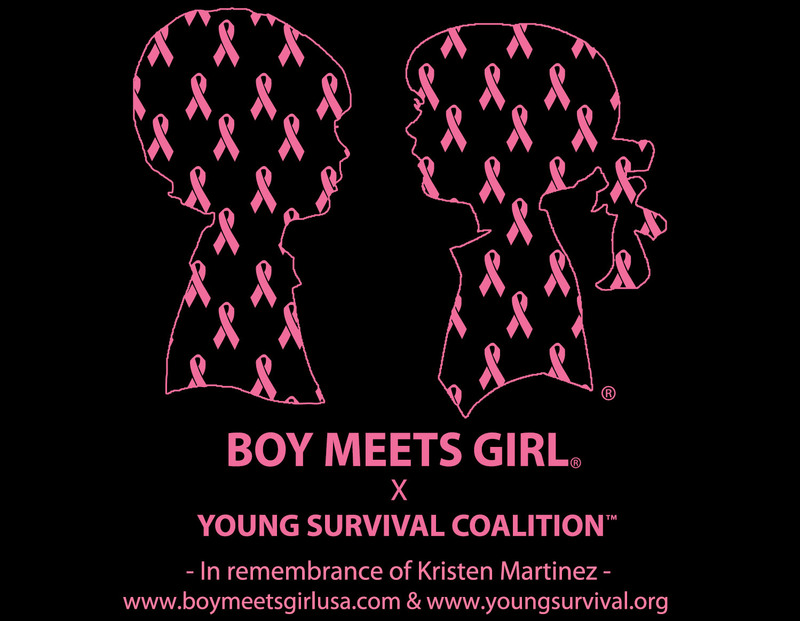 My Boy Meets Girl® note pad! Perfect for keeping all my important notes together! And it's super stylish too! 5. I always like to have something on my lips to keep me looking a little alive(lol). One of my new favorite finds is the Kissaholic Aphrodisiac Lip Stains by Booty Parlor! It is perfect for taking me from the office to the NYFW red carpet! We're giving away 3 colors: LoveBite (berry), Frenchy (red), and Nibble (pink)! 6. A girl needs to keep up with her hair during this week. So I go either natural curly or keep it tame by blowing it dry and straightening it with my Infiniti Pro by Conair™ 1875 Watt Salon Performance AC Motor Hair Dryer and my Infiniti Pro by Conair™ 1-1/4" Tourmaline Ceramic flat iron. That's a $500+ gift value!! So here's where it gets fun...not only do I want to share with you my NYFW survival guide, I want to offer one lucky winner 2 tickets to my NYFW show! It's next week, February 13th at 2pm, so to use the tickets you'll need to be in the New York area or willing to get yourself here! Enter with Rafflecopter below! Contest will close on Sunday, February 10th and winner will be announced Monday, February 11th! P.S. ALSO CHECK OUT THIS AMAZING CONTEST GOING ON RIGHT NOW WITH HARMAN KARDON, EPIC RECORDS, STYLE 360 PRESENTED BY CONAIR AND BOY MEETS GIRL(R) TO ALSO WIN A CHANCE TO MEET ME & LEAH LABELLE AT NYFW AND BE IN A PHOTOSHOOT WITH US THAT WILL THEN BE ON A TIMES SQUARE BILLBOARD ALL DETAILS HERE! Because I have amazingly long red hair and I could use everything you're giving!!! My blow dryer just died on me. I really would love to win. I have always wanted to go to NY Fashion Week - to be surrounded by so much beauty - it would be like a kid in a candy store! I love that you have Booty Parlor Kissaholic lip glosses in this giveaway - I have been dying to try them!! These things would make me feel fashionable and fabulous. I want this one so bad. I do not own a hair dryer..Would love to get one! All these products look amazing! I would love to win. I could use these items to pamper myself! Oh, how I need it simply because I always put my kids first and my needs are put on the back burner!! Going to fashion week would be my dream trip of all time! I love fashion of course but to see all things that go on in person would be super. Pick me Kay Jay! I love playing with my hair and trying new styles! My hair seriously needs some help! I am a Hair junky! I have very long hair and would LOVE all of this!!! Why do I want to win the NYFW survival guide Prize? 1. Boy Meets Girl® Minky Bean Slippers! Because they are so cute and would give my feet a break from heels! 2. Zico Coconut water! A Healthy, delicious—what else could i want in a beverage?! 3. GoJane shoes Because I'm always on the hunt for new shoes—especially cute and comfy ones! 4. My Boy Meets Girl® note pad! Because it's pretty way to stay organized! 5. Kissaholic Aphrodisiac Lip Stains by Booty Parlor! Because my Spring lip look need a fresh style and these thee colors are perfect! 6. Infiniti Pro by Conair™ 1875 Watt Salon Performance AC Motor Hair Dryer and Infiniti Pro by Conair™ 1-1/4" Tourmaline Ceramic flat iron. Because my straight flyaway hair needs lots of styling to look gorgeous! I need all these products! Would love to win! My daughter who just moved out on her own could really use these.Great Giveaway! I'll put all items in this giveaway to use immediately. I like to watch the new styles on the runway, then wonder if I can pull off the same look. I want to win this package because I could use new slippers and new hair tools to tame my hair. Also I never been to NYFW nor New York. It would be awesome. I'd love to win these fabulous prizes and go to Fashion Week because I'd love to see all the new Boy Meets Girl fashions hot ON the Runway! I have crazy frizzy hair and I have four daughters - need! sounds like a great spoil me Valentines present to me! My haire products are so old and I need a refresher course on taking care of my hair. 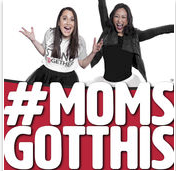 I would love to win because I so need new hair care products! Hop e you have a great time at Fashion Week. I'd love to win these great products for my wonderful wife. I have poofie thick hair and i need this new stuff to make my hair and look and feel beautiful... Not only that it would be a wonderful treat for my self. not only that my hair tools are old and its time for some new ones. I have long, wavy blonde hair and would be extremely grateful to feel like me only better!! soooo many great products!! I am just now getting into the girly stuff at almost age 30 so I need some help!! Fun and fantastic products! Who wouldn't want them! And who wouldn't want to go to NYFW?! Would be an AMAZING experience, and to show up looking fashionable with your help is a great plus too! What an awesome prize package, The lucky winner will feel like a princess on Christmas!! Thanks.. I would love to go to NYFW because I know it would be fun! I absolutely love the package. My daughter loves to play and do different things with her hair. She just finished a cosmo class in hight school and wants to do everyones hari all the time. This prize would help her do just that! I would love to win as my daughter takes all of my hair products and anything nice I buy for myself!! This would be such an amazing prize to win because my daughter is starting Cosmetology school and having some extra supplies would be amazing not to mention NYFW would be a dream come true for the both of us. This would be a so great!!! Thanks for the opportunity! I would love to experience New York fashion week once! I want to win because it is full of really awesome stuff and who wouldn't want to go to NYFW that would be amazing! I would love to win! I need new hair tools. I really need to style myself both inside and out. Such a cool variety - lots I want to try! I would love to win these awesome goodies, and I think it's EVERY fashionista's dream to go to NYFW and see it all up close and personal! This would be the ideal giveaways considering I'm going to need it this week! I'm covering so many NYFW events and can definitely use this to keep me going. GoJane is one of my favorites sites for affordable and trendy pieces so a gift card would be the perfect way to update my wardrobe! I lived in NYC for many years and miss the fashion and the people...always wanted to attend a NYFW while I lived there...so this is an awesome opportunity for me to come back home to NYC. I also would love to try the straightner...mine doesn't really work well for my wavy hair!! This would be amazing. I have 3 young boys and no time. So I could use some style help. It's always kids, husband first. This prize pack would be all about me. The blow dryer and straightener would help me get nice, frizz free hair. The Minky Bean slippers would be nice to lounge around in. I would love to surprise my best friend with the tickets to NYFW. Attending fashion week has long been a dream of mine! I consider myself a fledgling fashionista and would love all of the inspiration! Thanks or the amazing giveaway! Well first of all I could never afford to buy these products in my life, those kind of things are new to me. The way things are right now for me I can't afford to waste any money on me. I am starting a new beginning this new year finally as an independent woman. I know things are going to be hard but I am going to make my parents proud and less worry for me. I have always had a passion for the arts and design. Fashion has been one of my biggest passions since I was like 8 and even though my father has been against it I want to show him all I can do and will do. I want to become a fashion designer and I won't stop until I achieve it. Well I want to achieve lots of things. Fashion Week is like... there are really no words to describe how much I want to go... More than just a dream, it would mean everything to me to see if just once the NY Fashion Week. See the many types of fashion styles and creativity within the clothing and just get an inside at the designers' style. Wow it would be amazing. Thank you Stacy for this chance to go the NYFW and on top of that be able to win these products. My mother's birthday is February 10th and she talks about Fashion Week every year and haven't been yet. This would be perfect for her birthday. We are New Yorkers and love fashion. Fashionistas!!! You are great Stacy and we would love to sit at your show. I love the survival kit. Every woman should have one. I would love to win....a great excuse to get to New York! I definately need all the hair tools! I would love to win the hair tools, it would be a great gift for my best friend. I could not use the NYFW tickets to the show since I will not be in NY but the swag would be like almost enjoying a little bit of FW. It's been my absolute dream to go to NYFW since my first season of Project Runway. Plus all these great styling tools could be wonderful to start out a NYFW collection! I would LOVE LOVE LOVE to win! You are Awesome STacy! I desperately need a new hair dryer too! i would love love LOVE to win. I also need a new hair dryer! Love you Stacy! I need everything on there!! Love that stuff!! My roommate and i need a new hairdryer, were using a travel one since old one broke! I would love the opportunity to experience fashion week in person! I would love to win this contest because I know that all the stuff you are giving away can be so useful to me, and I can really use a new hair dryer right now as my current one just broke (and so am I, LOL). And since I have naturally straight hair, I can just give my mom the flat iron, she loooves straightening her hair haha, she'd be so happy, I can totally imagine her reaction right now haha! Plus I just recently have gotten obsessed with shoes!! 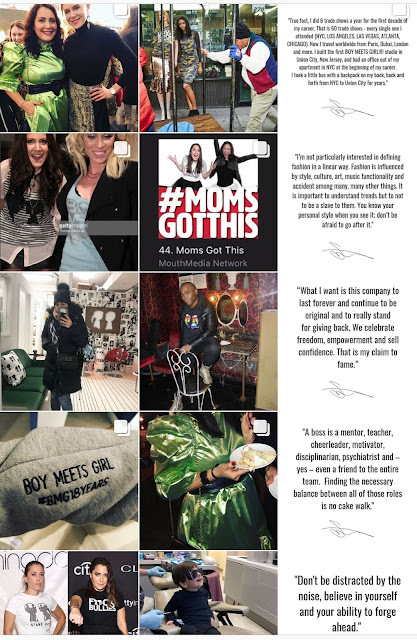 So I'd love it if I win the $50 GoJane gift card :D Although I don't think I can go to the fashion show :( (it's my dream to attend one though!) I still think I should win these stuff and that I deserve it :D I hope I win, if not, well congrats to the chosen winner! :D Anyways thanks for the awesome giveaway! Have fun on the day of the show! My hair desperately needs this... Thank you so much for offering!!! To see the sites.. and post photos.. maybe score some fashion week flair in the process! My daughter and I would love this!!!! Sounds like fun- have a great time at fashion week! Thanks for the great giveaway. Heard these are amazing! Definitely in need of a new straightener! Mine pulls out my hair!! This old granny of 4 needs some help. Pick me! My wife Need's a Decent Hair Dryer and This One Is Bomb! Very Nice! Well I would love to win because in my life I have always wanted to look beutiful, I am not aloud to buy any beuty products/hair products because my parents won't let me spend it on hair stuff so I hope I win (even though it is unlikely) Good Luck everyone! Because i love all these products.Thanks so much for the chance. This NYFW Survival Guide looks so fun! 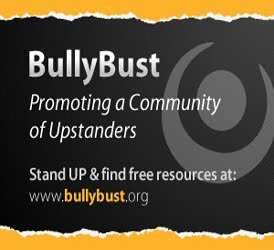 Great giveaway!Could really use this! Why because it would be great to spoil myself! thanks! Ive been a forever fan of BMG!!! Would be awesome to win these prizes. I would love the chance to pamper myself and this would be the best! To see the city and share with my girl. NYC is amazing....Fashion week is amazing.....and this giveaway is amazing! I want all the prizes! Everyone can use a bag of goodies to beat the winter blues. I just did a little post on NYFW.